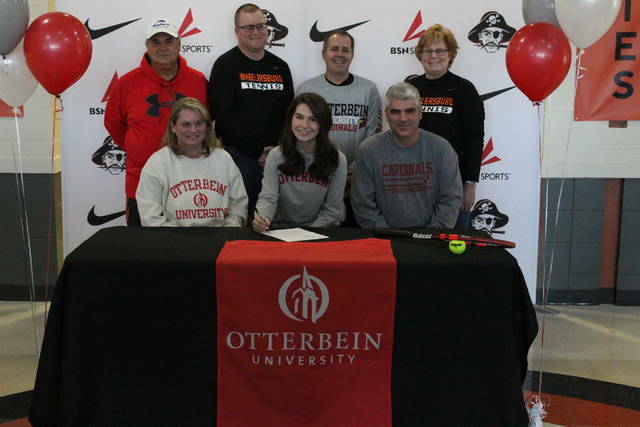 Wright signs LOI with Otterbein U.
Wheelersburg senior Lea Wright signed her letter of intent to play tennis for Otterbein University at her signing ceremony at Wheelersburg High School Wednesday afternoon. She is joined by Tom Carter (far left), Brian Jackson (center left), BJ Lehoist (center right), and Becky Jackson (far right), as well as parents Jodi and Larry Wright. WHEELERSBURG – Otterbein University and Wheelersburg senior Lea Wright were a match made in heaven from the first time Otterbein considered adding Wright to their girls’ tennis program. At her signing ceremony Wednesday afternoon at Wheelersburg High School, Wright made her intentions to play tennis at Otterbein official by signing her letter of intent. During her time at Wheelersburg, Wright was coached by her mother Jodi, as well as Becky and Brian Jackson, the parent’s of fellow Wheelersburg senior tennis player and Mt. Vernon Nazarene University signee Drew Jackson. Wright had a great senior season to cap off a great career in the orange and black of Wheelersburg. During her sophomore, junior, and seniors seasons, Wright was named the SOC singles player of the year, as well as an SOC player of the year runner up during her freshman season. During her senior season, Wright finished as runner up in the sectional championship match to Unioto’s Sylvia Gray. Wright and Gray would face again in the championship of the district tournament in Athens a week after their sectional match. Because both players in singles competition who make reach the district championship also advance to the state tournament, Wright also added a state tournament appearance under her belt to cap off a stellar high school career. With the opening of the new Wheelersburg tennis courts this past fall in September 2018, Wright sees this as an opportunity for the future of Pirates tennis to continually grow.